The NACCHO list frame consisted of 3,707 records. The sample file was first sorted by central urban/other urban/rural status. 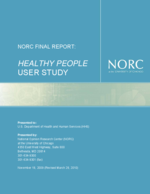 The NACCHO file did not include an urban/rural status variable. Therefore, this variable was constructed for sampling using the zip code to map each organization to the county in which it resides and to determine whether the location was inside a Census defined Metropolitan Statistical Area (MSA)3. Additionally, the list was sorted according to Census region, Census division, state, and zip code to ensure a regionally representative sample.